Prime Minister Thomas Thabane (file photo). 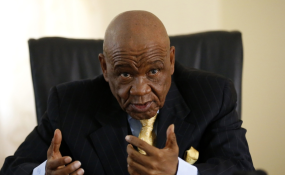 The Prime Minister and leader of the All Basotho Convention (ABC), Thomas Thabane, recently savaged Professor Nqosa Mahao, saying the latter was "just a rag" who should not be elected to deputise him. Addressing scores of party members at a rally in his Ha Abia constituency in Maseru over the weekend, Dr Thabane vowed his party's faithful would not elect Prof Mahao to succeed him at the helm of the ruling party. He said Prof Mahao was not even a member of the ABC and challenged backers of the National University of Lesotho (NUL) Vice-Chancellor to leave the ABC and join in a new party the Prime Minister alleges Prof Mahao has started. A day later on Monday, the premier apologised for the blistering attack, saying he had used "harsh words" on Prof Mahao which were "not acceptable". Prof Mahao was recently nominated for the deputy leader's post in the ABC. The ABC will hold its electoral conference on 1 and 2 February 2019. Prof Mahao was set to contest against Finance Minister Moeketsi Majoro, party chairperson Motlohi Maliehe and the incumbent, Prince Maliehe, who is also the Transport and Public Works minister. He was nominated by the ABC's Koro-Koro constituency committee but the ABC's national executive committee (NEC) disqualified Prof Mahao on the grounds that he had not "served at the party's branch and constituency levels for at least 24 and 36 months" respectively as required by the party's constitution. The Koro-Koro constituency committee however, insists that Prof Mahao meets the requirements to stand in the elections. It has since taken the matter to court but lost in the High Court this week. The committee has since appealed to the Court of Appeal. And on Sunday, Dr Thabane broke his long silence on Prof Mahao, telling the Ha Abia rally that the latter was a "rag" who should not be elected to deputise him as he was not even a member of the ABC. Dr Thabane said Basotho had an unfortunate tendency of giving power and responsibilities to people who later ill-treated them and turned them into their slaves. "People stand in long queues to vote for individuals who, when elected into office, think they are entitled to make the people their slaves. Please stop giving me people who are going to make you slaves because I am fed up because of people who don't respect the electorate. "Tell that person to leave the ABC alone. Let him go and start his own party and all those who believe in him should openly declare it so that the rest of us may count ourselves and know exactly how many of us are left (in the ABC)," Dr Thabane charged. Dr Thabane's position is not up for contest at the February conference. But with the Prime Minister nearing 80 years of age, whoever wins the deputy leader's race is seen becoming his obvious successor. Dr Thabane however, vowed that even if he were to step down Prof Mahao would not succeed him. "If I were to step down ABC members will not elect him. Rather they will vote another ABC member not a member of the (opposition) Popular Front for Democracy (PFD). "If there are those who are already flowing with this river, declare yourselves so that we may know exactly how many people I am leading. So that if there are none that I'm leading I will go about with my own personal businesses as I have a lot to do with my life." Dr Thabane subsequently apologised for his outbursts, saying he had been too harsh on Prof Mahao. On Monday, the premier told one of the local radio stations that he had used "harsh words when talking about Prof Mahao, which I later realised were not acceptable". "I therefore don't take pride in the words and I retract them and I am sorry that I ever uttered them," Dr Thabanetold the radio station on Monday. Prior to Dr Thabane's apology, Prof Mahao said he had "no interest" in responding to the premier's comments. "People will always throw things in your face and at your feet to distract you and make you lose focus. But I am not ready to do that (lose focus). I have lived with such things for as long as I can remember and I have made it through by ignoring any negative talk about me," Prof Mahao said. He said his main focus was on campaigning for the party elections to ensure he wins. "I have noted what he (Dr Thabane) said but I am not going to let it divert my attention. I am going ahead with the contest (for the ABC deputy leader post) and it would be nonsensical to say I have started a party," Prof Mahao said. It remains to be seen whether or not Prof Mahao will contest in the elections after the High Court on Sunday threw away an application by the Koro-Koro constituency committee seeking the nullification of the ABC NEC's decision to disqualify him. The Court of Appeal is yet to hear the case . Copyright © 2019 Lesotho Times. All rights reserved. Distributed by AllAfrica Global Media (allAfrica.com). To contact the copyright holder directly for corrections — or for permission to republish or make other authorized use of this material, click here.